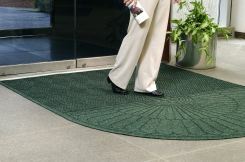 We offer Anderson indoor and outdoor mats, for your entry way, hallway and work areas. We have a variety of styles and colors. We can create custom logo and vanity mats also! 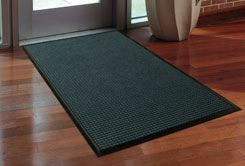 FACT: Rental mats are very expensive as a long term matting option. At an average cost of $20.00 per square foot, per week a single 3'x5' rental mat cost a facility $780.00 over a five year period. In contrast, a purchased 3'x5' Waterhog mat, cost the facility approximately $100.00, once! Exceptional performance and extraordinary beauty. An amazing mat series combining all of the performance of our Waterhog Premier mat with two additional features: an innovative rubber-reinforced face design for added beauty, and a green friendly face constructed of 100% post consumer recycled P.E.T. polyester fiber system that is reclaimed from plastic bottles providing a mat surface with an attractive look that's easy to maintain. The face design can be configured three different ways—a half oval pattern, a rectangle with the half oval on one end, and a rectangle with half an oval on each end. Additionally, WaterHog Eco Grand Premier mats have a 100% rubber backing that contains 15% to 20% post consumer recycled car tire rubber. Perfect for most applications inside or out, Waterhog Classic's unique design makes it revolutionary. The rubber reinforced face nubs and waffle design provide crush proof scraping action. 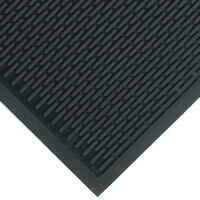 The raised rubber "water dam" border traps dirt and water – keeping them off carpet and floors.